Singer 20-10 Tension Bracket w/Tension Screw Stud - Blk. 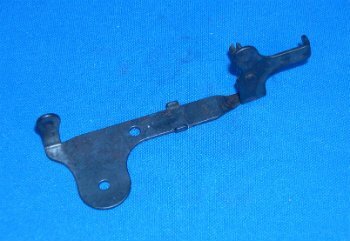 Toy Sewing Machines & Parts > Singer 20-10 Tension Bracket w/Tension Screw Stud - Blk. This is a black Singer 20-10 Tension Bracket #29979 w/Tension Screw Stud #419J. This is part of the "top works" on a rectangular base machine. This does not fit the Singer with the oval base.